April 11, 2017 (Source) — International Lithium Corp. (TSXV: ILC) (the “Company” or “ILC“) is pleased to announce, with strategic partner Pioneer Resources Limited (ASX: PIO) (“Pioneer”), and further to the Company’s news release of March 13, 2017, the analytical results from the recently completed winter drill program at the Mavis Lake Lithium Project in Ontario, Canada. 1.45% Li2O over 16.55 metres from 74.55 metres and 1.40% Li2O over 23.10 metres from 122.00 metres in drill hole MF17-50. * All widths reported are drill core widths and have not been converted into true width. True width of the drill hole intercepts, which may be shorter than those reported, are currently unknown. Drilling at the Mavis Lake Lithium Project (“Mavis”) commenced on February 4, 2017 under the direction of Pioneer (the Company’s strategic partner) and was completed on March 2, 2017. In total, 12 oriented diamond core drill holes were completed for a total of 1,305 metres across three target areas: PEG006, PEG006.5 and PEG018 (Fig. 1). Four holes were drilled during the current campaign to follow up on mineralization encountered in previous drill holes MF-11-12 and MF-12-24 (see Company news releases dated January 12, 2012 and February 19, 2013). Each of the current drill holes intersected spodumene-bearing pegmatites of varied thickness (Table 1). Drill holes MF17-49 and MF17-50 intersected zones of mineralized pegmatite at deeper depths than previously encountered and represent a new discovery at the Mavis Project. Hole MF17-49 returned 1.70% Li2O over 26.30 metres from 111.9 metres, including 2.97% Li2O over 7.70 metres with one sample grading 4.20% Li2O over 1.15 metres. To date, the drilling in the Pegmatite 6 target area has drill tested a horizontal strike length of 60 metres and down dip to a maximum depth of 145 metres below surface. 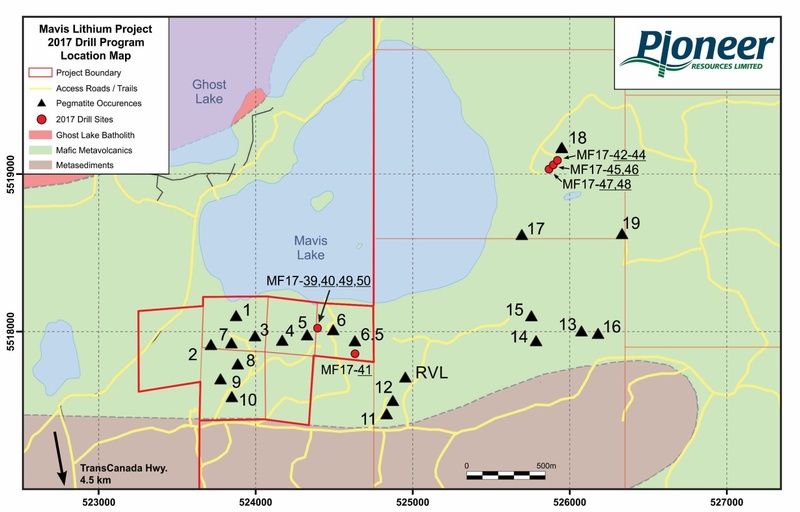 Figure 1: Generalized location of the 2017 drill holes relative to known pegmatite occurances at the Mavis lithium project. Table 1: Selected assay results from the Pegmatite 6 Target Area. *All widths reported are core widths and have not been converted to true widths. True width of the drill hole intercepts, which may be shorter than those reported, are currently unknown. Drill hole MF17-41 drilled at the Pegmatite 6.5 Target Area returned no significant results. Seven drill holes were drilled to test the lateral and down-dip extent of Pegmatite 18, a shallow, south-westerly dipping pegmatite that has been traced for 215 metres on surface (see Company news release dated December 1, 2016). All seven drill holes intersected Pegmatite 18 with the intercepts varying in spodumene content (5-45%) and drill hole intersections (1.5 – 9.85m). Table 2: Selected assay results from the Pegmatite 18 Target Area. Laboratory work was conducted by Activation Laboratories Ltd. of Ancaster, Ontario, with samples submitted by Pioneer’s representatives to their preparation facilities in Dryden, Ontario. Activation Laboratories Ltd. is an ISO 17025:2005 and CAN-P-1579 certified laboratory. Analysis was performed using a Na-peroxide fusion digestions followed by an ICP-OES and ICP-MS finish. Afzaal Pirzada, P. Geo., a “Qualified Person” for the purposes of Canadian Securities Administrators’ National Instrument 43-101 – Standards of Disclosure for Mineral Projects, and Consultant to the Company, has reviewed and approved the scientific and technical information contained in this news release. Table 3: Preliminary drill hole collar location summary. In recent meetings of the Management Committees for the Avalonia lithium pegmatite project in Ireland and the Mariana lithium brine project in Argentina, it was decided that Ganfeng Lithium Co. Ltd., will take over the role as Manager of each project and continue to carry out the exploration work pursuant to the respective option and joint venture agreements. International Lithium Corp. has a significant portfolio of projects, strong management, robust financial support, and a strategic partner and keystone investor, Ganfeng Lithium Co. Ltd., a leading China-based lithium product manufacturer. The Company’s primary focus is the strategic stake in the Mariana lithium-potash brine project located within the renowned South American “Lithium Belt” that is the host to the vast majority of global lithium resources, reserves and production. The Mariana project, strategically encompasses an entire mineral rich evaporite basin, totalling 160 square kilometres, that ranks as one of the more prospective salars or ‘salt lakes’ in the region. Current ownership of the project is through a joint venture company, Litio Minera Argentina S. A., a private company registered in Argentina, owned 80% by Ganfeng Lithium Co. Ltd. (“GFL”), and 20% by ILC. In addition, ILC has an option to acquire 10% in the Mariana project through a back-in right. Complementing the Company’s lithium brine project are three rare metals pegmatite properties in Canada known as the Mavis, Raleigh, and Forgan projects, and the Avalonia project in Ireland, which encompasses an extensive 50km-long pegmatite belt. The Avalonia project is under option to strategic partner GFL, that currently owns 55% of the project. The Mavis and Raleigh projects are under option to strategic partner Pioneer Resources Limited (ASX:PIO) pursuant to which Pioneer can acquire up to a 51% interest in the projects. The Mavis, Raleigh and Forgan projects together form the basis of the Company’s newly created Upper Canada Lithium Pool designated to focus on acquiring numerous prospects with previously reported high concentrations of lithium in close proximity to existing infrastructure. Pioneer explores for key, global demand-driven commodities in prospective geological domains, in areas with low geopolitical risk and with established infrastructure. Its property portfolio includes lithium assets in Canada and mining regions of Western Australia, plus strategically located gold and nickel projects in Western Australia. In addition to the Mavis Lake and Raleigh Lithium Projects, Pioneer has been advancing its 100%-owned Pioneer Dome Lithium Caesium Tantalum Project. Except for statements of historical fact, this news release contains certain “forward-looking information” within the meaning of applicable securities law. Forward-looking information is frequently characterized by words such as “plan”, “expect”, “project”, “intend”, “believe”, “anticipate”, “estimate”, “will”, “could” and other similar words, or statements that certain events or conditions “may” or “could” occur. Such forward-looking information is based on a number of assumptions and subject to a variety of risks and uncertainties, including but not limited to those discussed in the sections entitled “Forward-Looking Statements” in the interim and annual Management’s Discussion and Analysis which are available at www.sedar.com. While our management believes that the assumptions made are reasonable, should one or more of the risks, uncertainties or other factors materialize, or should underlying assumptions prove incorrect, actual results may vary materially from those described in forward-looking information. Forward-looking information herein, and all subsequent written and oral forward-looking information are based on estimates and opinions of management on the dates they are made and are expressly qualified in their entirety by this cautionary statement. Except as required by law, the Company assumes no obligation to update forward-looking information should circumstances or management’s estimates or opinions change.